State got no money again? Meanwhile: late last week, slipping under the media radar courtesy of Michael Jackson (and Iran’s mild case of unrest before that), the US House passed a bill to establish cap-and-trade emissions controls not too far removed from Kevin Rudd’s plan for Australia. I’ve seen a few different places make this out as a big thing (heck, even the Fox News anchor last night was freaked by it). Yet this decision is nothing, because the law still needs to pass a hostile Senate — so, months at the very least. Given current conditions, I’ll be surprised if the US government actually implements any action on global warming before Obama’s term expires in 2012. Voting for hope and change and stuff! It wasn’t a close race, in the end, but none of the Obama supporters I know felt comfortable until it was finally, definitely confirmed. And how! Dripping with symbolism and references to the past, I thought the victory speech was amazing (did he sound more like Martin Luther King, or more like John Kennedy?). It was delivered with a skill of oration that few other world leaders could ever match, and was dignified far beyond the weakness of McCain’s concession speech. I was particularly interested in how the Internet played out in the victory! Within minutes of the “Obama’s won” announcement (led by CNN pretty much on the dot of west coast polls closing), my Facebook news feed was filling with celebratory status messages, nevermind expected channels like Twitter and the blogosphere. Everybody I know of used the Web to keep up with results. And the Obama campaign sent a thankful e-mail to everyone on their list ten minutes before his speech! Amidst all of this, my housemates were entertaining to watch! It was one thing to see people holding signs at traffic lights and train stations saying “vote Obama” or “yes on proposition 8” (see below), but it was quite another to see otherwise sensible people go insane with cheering and dancing and other expressions of having their faith restored, simply because a different party won an election! I am disorganised, which means it’s time for another potpourri list. This is a cool idea and probably worth supporting. 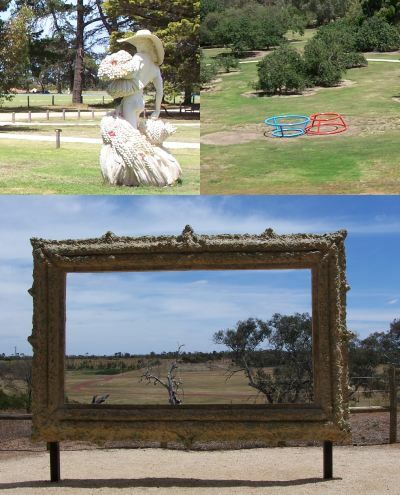 The report in yesterday’s West Australian says it’d be an “Australian first”, which hardly sounds right — I took the photos above in a similar sculpture park in Werribee, Victoria. Good ol’ IMDB finally has a new design. About freakin’ time. The Federal Government’s plan to outlaw incandescent globes is a bit of a shock and reeks horribly of taking an easy political target just to seem clean and green. It’s a good measure, to be sure, and should prompt innovation among fluoro manufacturers, but it’s not the panacea that it’s being talked up to be. The thing with most ‘environmentally friendly’ technologies is that they’re a case of lesser of two evils — and in this case, compact fluoros are filled with mercury, thus creating a bunch of disposal headaches. It’s a manageable problem, of course, but one that needs to be considered when saying things like “800 000 tonnes of carbon dioxide saved”. Since I don’t exactly have a copy of The Diplomat in my back pocket, I can’t read the exact words of Kevin Rudd as he was reported last week. Apparently he is interested in being both an ally and constructive critic of US policy, which reminds me of a Kim Beazley speech I heard some years back: “Australia should be the friend America needs, not the friend America wants”. But he also talks about APEC and seems to criticise John Howard for supporting the East Asia Summit. I’m commenting on fragmented quotes, but he may be quite wrong, since APEC has thoroughly lost its way. His talk of revitalising APEC is good, as long as it involves reform, but I doubt it’s achievable — the Sydney meetings are straight before the election. As for the EAS, Howard deserves congratulations (not criticism) for representing Australia at a meeting that has much better prospects for earning long-term relevance.